So I finally got caught up in the hype and bought some products from Kylie Cosmetics. If you haven't heard about this brand, (you've been living under a rock) to sum it up, it's owned by the one and only Kylie Jenner. People have different opinions on the Kardashians/Jenners. To be honest, I'm a fan of Kylie and Kim (not die hard though). I follow both on snapchat and I always see Kylie talking about her lip kits. Which is what pushed me to pick up some lippies from Kylie's brand. I feel like the hype around them is slowly fading a bit. When she first came out with them, you'd be lucky if you got to a hold of some. Lately, her products haven't sold out as fast as they used to. That, or they just produced a larger amount to sell. To my point, it was easy for me to find what I wanted because most of the items were in stock. Shipping was ok. I think I ordered it on a Thursday or Friday and it ended up being delivered the following Wednesday. I guess that's a good amount of time for it coming from California, USA to Toronto, Canada. 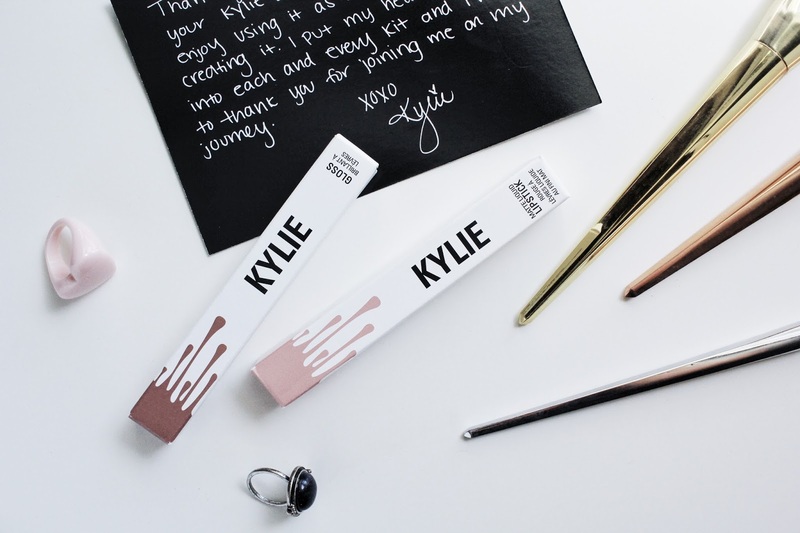 The package came in a medium sized box and when opened, the famous Kylie Cosmetics logo is written on the top and, aside from the actual products, includes a thank you note signed by Kylie. As for the packaging of the lipstick/gloss, I really like the box it comes in but the actually tube design is a different story. Something about the design of the tube is really meh to me. It looks a little too dark or even childish for my liking. Maybe if it was metallic like the ColourPop lipsticks, I'd like it better. But it's not a big deal, it's all about the product, right? Despite a bunch of bad reviews on the lip glosses, I still decided to pick one up because I've seen a bunch of swatches of this lippie and fell in love with the shade. On the site, it is described as a "warm mocha brown" and that's a pretty spot on description. I love brown toned lipsticks so I chose to go for this one and I'm so glad I did. Whenever I reach for this, I always have a moment of anxiety because I'm scared that the wand is going to come out f*cked up, just like I've seen many people complain about. But so far, it's been good. As for the product itself, I love it! Application is easy and it glides on really smooth. It doesn't feel sticky on the lips, it's rather comfortable. The only down side to this is that when my hair gets on it and I try to move my hair, it'll leave little lines on my face (if you get what I mean). But that's not really the gloss' fault. Overall, I really like this product and I'm considering getting other shades! Of course I had to pick up a liquid lipstick as well, so I ended up getting Koko K. On the site it's described as a "pale pink". I don't usually go for these type of shades because they wash me out a bit but this one doesn't look too bad especially when paired up with a darker lip liner. Application is easy with this as well but.... I do not like this formula at all! It feels so drying on the lips and it's really uncomfortable. Throughout the day, I find myself rubbing my lips together and it just feels so chapped and cracked. I might just give this away to a friend because I can't stand my lips feeling that way. I probably won't purchase any more shades from the liquid lipstick collection unless they reformulate them! My final thoughts on the company itself is still undecided. Because I liked one product and not the other, I can't really say that I like or dislike them. I think I'll have to give the metals, kyshadow or another gloss a try before I can decide whether or not I like Kylie Cosmetics. With that being said, I probably will be purchasing some other things from them (just not the liquid lipsticks!) so that I can see for myself whether the hype is really real around these. 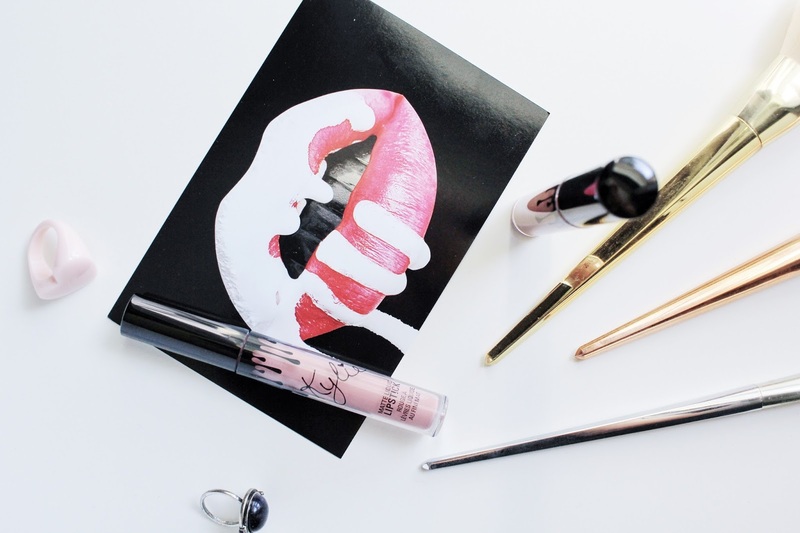 Have you tried anything from Kylie Cosmetics? What are your thoughts on them?